All those who want to spend any money at all on a new roof, raise your hand. We know yours isn't raised because hardly anyone wants to spend money on a new roof. Almost without exception, a new roof comes under the need to column. 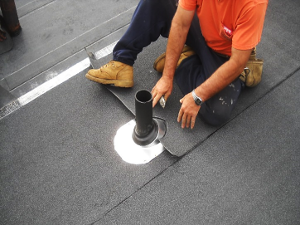 Roof replacements are usually the result of major damage to your roof or a roof that is past warranty and decaying. In either of these cases, a roof replacement is a necessity. If you think your home needs a roof replacement, contact the experts at Burr Roofing, Siding, & Windows today! We will carefully evaluate your home and help you determine the best course of action to solve your needs. Call us today for a free estimate in Bridgeport, Stratford, Fairfield and the nearby areas. What happens if you wait to replace your roof? Even if you've seen a leak, the truth is a failed roofing system has occurred months and sometimes even years before water gets into your home, the space within which you live. Our experience is that many homeowners don't take action immediately upon noticing some type of roof deterioration. We think that's a mistake. Not many people make annual roof inspections part of their house maintenance routine, which means noticing roof deterioration happens either by accident or when something major occurs. A failing roofing system can become first evident by looking on the ground. Roof granules present at the end of leaders, especially after a heavy rain, are evidence that a roof's useful life may be at an end. Retrieving a kite or Frisbee from the roof or cleaning out a clogged gutter or leader might provide the first opportunity to notice something amiss on your roof. When was the last time you took a good look at your roof? Do any of these roof problems mean water is getting into my house NOW? In a word, YES! Have you heard the old saying that "water always finds its own level?" Any of these roofing problems gives water a chance to do that: to congregate and pool. Just like a mosquito can find its way into your house through the most innocent of cracked doors or frayed screens, so too can water find its way into your house under cupped, curled or missing shingles, failed flashing or by adhering to moss or algae growth. Then what happens? Water infiltrating your living space depends on two things: 1) the amount of water (for example, during a big rain storm or snow melt, the amount can be significant), and 2) the continued deterioration of your roofing system. Once a problem starts it usually ONLY gets worse over time. Unfortunately, no one has invented a roof that fixes itself! Should I put off a new roof until we have a leak or water problem? That depends. What's it worth to you to preserve what's under your roof? Are you using your attic for storage? Does your attic storage include items that will rot or deteriorate if exposed to water (files, records, books, wooden furniture and toys). Also take note that your insulation conserves energy only if it's not WET. If your roofing system has failed, even with the loss of one shingle, the costs associated with replacing your roof go UP every day you wait. With each passing day, it costs more to heat and/or cool your home due to soggy insulation. And since water damage gets worse over time, the contents of your attic are at risk of being stained, warped or otherwise damaged. Mold is becoming a bigger health threat every day. Mold loves wet surfaces and thrives wherever there is a recurring source of moisture. If you have seen mold in the attic, it could be you could just let it be. But like every living substance, mold reproduces, sending out spores in search of wet surfaces and other sources of moisture. Breathing mold spores can cause serious health problems. If your roofing system has failed, you could be one mold spore away from a serious health threat to you and your family. It's an unfortunate condition to find in your home an done that can keep you up at night worrying about. It simply doesn't pay to wait if you've seen signs of roofing system failure: the condition is very likely to keep gettng worse AND more expensive. The key is to recognize the signs early! If you think you need a partial or complete roof replacement for your home, the experts at Burr Roofing, Siding, & Windows are here to help. Our roofing specialists will evaluate your roof and help you determine the best solution for your home. We offer free estimates on all our work in Bridgeport, Stratford, Fairfield, New Haven, Milford, West Haven, Norwalk, Trumbull, Stamford, Shelton and throughout the surrounding areas.